Just In - The Perfect Thank You Gifts for a girl's birthday or sweet sixteen party! Each arrives beautifully gift wrapped. What more can a party planning Mom ask for? 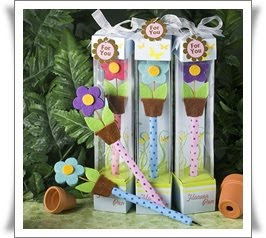 We love this adorable Flower Pot Topped Polka Dot Pen and so will her party guests! So bright, colorful and unique they'll just love to write with them each and every time. Available in three colors - blue, purple and pink. Priced at 1.30 - $2.30 each. Our Sweet Little Cupcake Lip Gloss is lip smacking good! 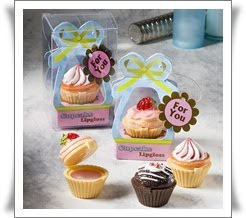 Each adorable mini cupcake is filled with coordinating flavored lip gloss. Girls will just love the chocolate, strawberry and vanilla flavors. They look so delicious they won't be able to wait to open them up! Visit our Birthday Favor Department today to view these adorable new arrivals and other great birthday favor gift ideas! We often have many clients ask for our advice when ordering their favors, and we love to assist them! First Impression Favors would like to share the answers to the ten most commonly asked questions we receive from our clients when ordering their party favors. 1-Try to incorporate your favors into your party theme. For example if you are having a Diamond Theme wedding, try favors with rhinestone accents. If you are having a Beach Theme celebration, try favors such as a tropical drink mix. 2-Mix and match your favor colors to coordinate with your color scheme for a stunning display. You will add an extra decor element to your tables without the extra cost. Here's one example - if your colors are pink, black and white, try ordering pink boxes with white bows and black rhinestone accents mixed with white boxes with pink bows and black rhinestone accents. Fill with alternating coordinating colored candies. 3-Your favors should be a reflection of you and should celebrate your personality. Select either colors you love, an activity you love or a city or place that holds special memories for you. 4-The general rule of thumb when ordering your favors is to order one favor for each single guest and one favor for each couple attending your event. 5- If you are having children and adults attending your celebration, try ordering two types of age appropriate favors. One example is children will love personalized candy bars while the adults will enjoy coaster sets. 6-When ordering a monogram on your favors or cake topper, traditionally the first initial of the last name is placed in the center. If the monogram is for one person the first initial of the first name is on the left, the first initial of the last name is in the middle, and the first initial of the middle name is on the right. If the monogram is for a couple, the first initial of the bride's name is on the left, the first initial of the couple's last name is in the center and the first initial of the groom's name is on the right. 7- If you are ordering personalized favors always double and triple check your order for spelling errors to prevent your favors from being printed with the incorrect celebration date or name. A simple typo unchecked can ruin your entire order. 8-When ordering personalized favors always carefully read the number of characters allowed on each line including spaces and punctuation so there aren't any delays in shipping your order. 9 -Always make sure you order enough favors for your guests. It is better to over order than to place a rush order for additional pieces. Dye lots may differ and you will incur additional shipping charges and perhaps rush fees. 10 -Have left over favors from your celebration? Why not donate them to a charity or a food bank if you are giving out edible favors? Your clergy from your ceremony or wait staff from your reception would also appreciate a token of your thanks. 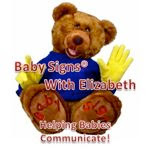 Author Wendy G. is Customer Care Specialist at http://www.firstimpressionfavors.com/. This article is available for reprint with author's bio included. Just In From Kate Aspen! 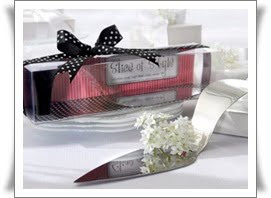 Coordinate your favors and table decor to truly impress your guests! The Imperial Collection brings together the rich red and gold hues of the Far East. These gorgeous votive candle holders can be used as favors, but when used as table decor at your reception their light emits a mesmerizing glow. Combine them with the coordinating Imperial Glass Photo Coaster Set as your favors and you will create an exotic Asian inspired elegance to your affair. Votive Candle holders are sold in sets of 4 starting as low as $5.40 per set. Coasters are sold in sets of 2 starting as low as $1.60 per set. Both arrive beautifully gift wrapped with optional matching personalized labels. "Thank you for the wonderful customer service and fast shipping. The favors were a big hit at my daughter's bridal shower"